Learning a foreign language helps students explore the world and better understand diverse viewpoints. UC Blue Ash College professors in the Foreign Language Department have expert training in their fields of study and experience traveling to countries that represent the languages they teach. Language, culture, study abroad programs and service learning courses taken in the Foreign Language Department meet general education requirements of Diversity and Culture and Humanities, Literature or Historical Perspectives. Courses in the American Sign Language Certificate meet general education requirements for the areas of Diversity and Culture and Social Sciences. The Foreign Language Lab and Resource Center is ready to help you succeed. Work on your foreign language homework, brush up on your skills, or get personal tutoring in the Foreign Language Lab and Resource Center in 337 and 338 Muntz Hall. All students who have had two or more years of a high school foreign language, or those who have prior knowledge of a foreign language, and who wish to continue studying the same language, must take the foreign language placement test prior to registering for a foreign language class. If a student has a foreign language requirement in his/her program, it may be satisfied with one or two options. Note that some programs have different requirements than those listed below. Be sure to check your program. To satisfy the foreign language requirement, a student must complete the final course in the sequence satisfactorily. If a student "tests out" of any portion of a sequence, only the remaining courses in the sequence must be completed satisfactorily to meet the foreign language requirement. Professor Teresa Roig-Torres was inducted into UC's Academy of Fellows for Teaching and Learning. There is a thorough interview process and several criteria that are required to be named a Fellow. A few key points are that you must show significant and extended contributions to excellence in scholarly teaching and student learning. Teresa will be recognized at the All-University Faculty Awards Celebration on April 17 at 3:00 pm in the Great Hall at Tangeman University Center. Dr. Angie Woods has developed quite a reputation for providing extraordinary service to our college, the university and her community. She launched service learning courses in the Foreign Language Department and coordinates a service learning project where students in the intermediate Spanish language courses tutor students in beginning Spanish classes. She serves as director of our Spanish Study Abroad Program and routinely incorporates community service into the program, including a project where students engaged with children in an orphanage in Costa Rica. In the community, Dr. Woods has volunteered for years at the Valley Interfaith Food and Clothing Center, which serves Spanish-speaking immigrants. She also assists other organizations, including the Hamilton County Park District and Cincinnati Public Schools, with translation for print materials and in communicating verbally with Spanish-speaking families. As UC Blue Ash's first French professor, Judy Baughin was the founding member of the French discipline at RWC/UCBA, developing and teaching all levels of French language and culture courses. She helped create the Foreign Language Department and served as its chair for an astounding 32 years (with a couple of breaks for leaves). She retired in 2008 as professor emerita. Judy and her late husband, Bill Baughin, were much-loved at UCBA Their commitment to the college and to our students will continue for many years. Please read more about their generosity and their heartwarming story of dedication to their students and our college over at UC Foundation. UC Blue Ash Professor of Spanish, Maria Ortiz, is helping lead an outreach initiative to assist students in Puerto Rico affected by last fall’s Hurricane Maria. In November and December 2017, Ortiz and associate provost for faculty development and special initiatives, Keisha Love, led an effort to round up a network of Spanish-speaking professors to offer online classes to students in Puerto Rico as the island recovers from the devastation of the hurricanes. Kudos to UC Blue Ash Spanish professors, Angie Woods and Teresa Roig-Torres, for each being honored with the "Outstanding Service Award for Heroic Efforts on Study Abroad" by UC Interim Provost, Peter Landgren. 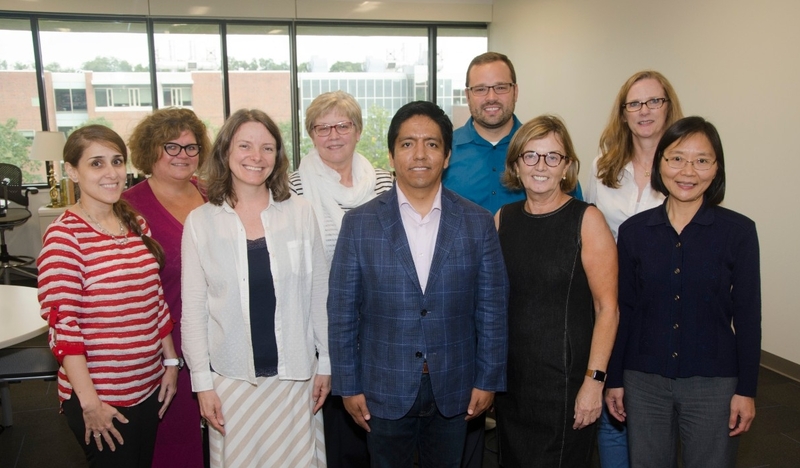 The award was presented recently at the monthly faculty meeting and is in recognition of the extraordinary work the professors did in leading our study abroad program in Peru over the summer. The program featured great opportunities for students to immerse themselves in the Spanish language and Peruvian culture, but there were also some challenging moments that were handled expertly by Angie and Teresa.